In our system we have a variety of Customer Status that are triggered when certain criteria are met. These criteria are defined by you. You can view these options from [Customer Account Summary page>>Edit] (see figure 1a). 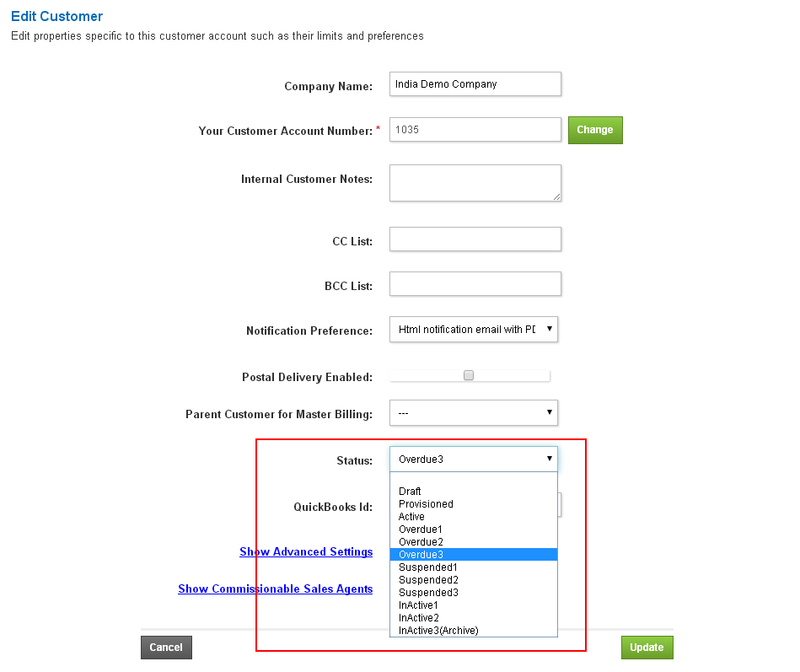 Figure 1b, shows where in the Customer Account Summary page the status appears. Active - An active status indicates that invoices will be generated, notifications will be sent out( unless specified otherwise), payments will be processed, if there is a card on file and the customer will appear on all reporting. This is the default status of a customer. Draft - This status is manually controlled. In order to have a customer in the draft mode, from [Customer Account Summary page>>Edit>>Status]. In the Draft status, no Invoices are generated by the system, no notifications are sent out and payments are not processed. The customer will appear on all reporting. The draft status can be changed to "Active" at any point to initialize billing for the customer. Provisioning - This status is similar to the draft status. It provides you with another layer of customer distinction and is most commonly used in the customer onboarding phase. To set the status to Provisioning, from [Customer Account Summary page>>Edit>>Status]. Overdue 1, 2 & 3 - the Overdue status is controlled by the settings in the Overdue notifications screen [System>>Notifications>>Overdue notification]. Here, you define the number of days after which a customer is to be considered Overdue 1. In this status, all customer billing is halted, no invoices are generated. This status may be changed manually from the [Customer Account Summary page>>Edit>>Status]. If the customer makes any payment on an outstanding invoice then the system changes the status from "Suspended" to "Active". NOTE: Once the status changes to Active, the system plays "catch up" and bills the customer for the period for which the customer was Suspended. For example, if the customer status was in suspended mode for 2 billing cycles, when the status changes to "Active" the system bills the customer for the 2 billing cycles that the customer was suspended. Inactive 1, 2 & 3 - This status is manually defined from [Customer Account Summary page>>Edit>>Status]. Billing is halted under this status.No notifications are sent out. Also if the status is set to "Inactive 3", the customer does not show up on the reports either and customer is set to Archive mode. This status can be changed manually or is switched to "Active" when a payment is made on the account.